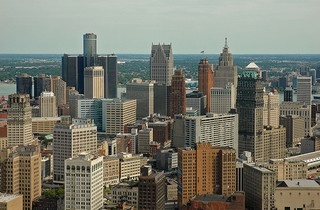 Detroit, $18 billion in debt and seeking bankruptcy protection, is desperate to reinvent itself. Once America’s 10th largest city and the world’s car-manufacturing capitol, the Motor City/Motown is exploring ways to regain financial viability with a population that’s 40% of its peak levels in the 1950s and with acres of vacant land. Why not plant grapes and build a new mecca for wine production in Michigan, a state with a robust and growing wine industry? Michigan already boasts dozens of wineries across five distinct wine-growing regions, but Detroit to date has not been part of this boom. Yet urban farming is indeed sprouting on plots of Detroit land abandoned by former residents, businesses and factories, and many city boosters see farming as an ingredient of a successful future for this city with such a vast physical footprint. Even if Detroit’s soil proved hopeless for growing any of the many local or European grape varieties, wine makers would find cheap real estate there to set up winery and tasting room operations. B. Nektar Meadery set a precedent for such a business model when its founders claimed an unused property in Ferndale, Michigan, a short drive north of Detroit, and scaled up their formerly home-based honey-wine production. Where the entrepreneurial spirit simmers, empty land goes begging, and thirsty wine lovers await, I see opportunity. This entry was posted in Odds & Ends and tagged B. Nektar Meadery, Michigan wines. Bookmark the permalink. And unlike Swift’s eponymous proposal, this one is not only modest but reasonable. The re-deployment of underutilized assets to more productive enterprise puts the “creative” in “creative destruction.,” With a re-trenched automotive industry leaving unemployed land and building stock in its wake (to say nothing of human capital) a series of non-traditional, out-of-the box entrepreneurial initiatives like this one will be needed if Detroit is to rise from its economic ashes.